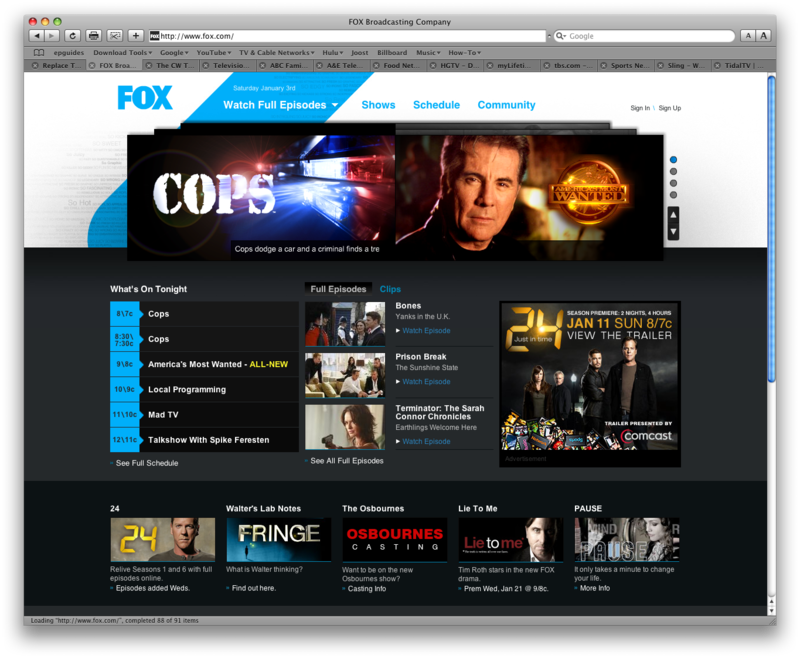 When I cut the cable six months ago, there was almost nothing to watch online (legally). 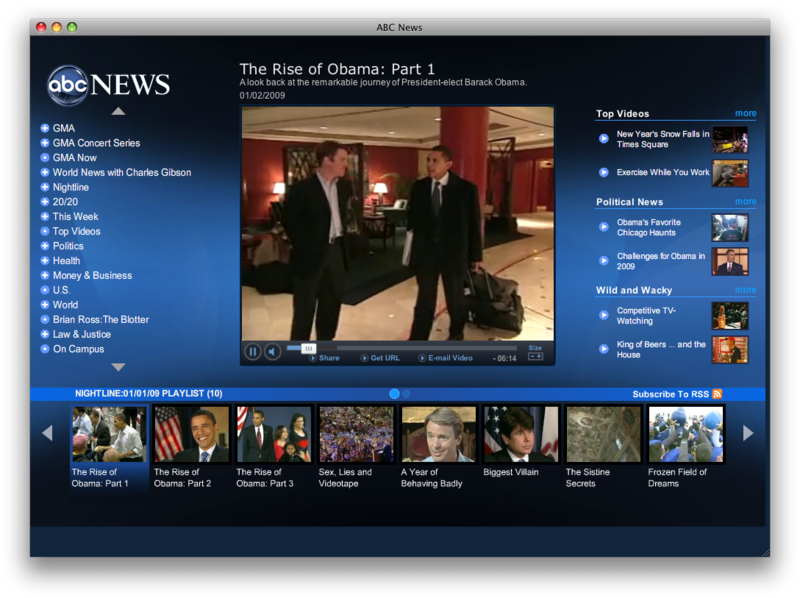 Now you can get almost every network TV show, many cable TV favorites, watch live sports, get cable and network news, local weather, and even watch full un-cut movies – legally and free. I’m beginning to see more and more articles about cutting cable and streaming everything. I don’t think the internet is quite ready for that. I still download over half of my content, but I am streaming more and more. After my technophobic brother took to Hulu, I started wondering how far streaming has come in six months and how newbie friendly it is. Most of the Networks are doing a good job pimping their websites, so I figure this is how most newbies would take their first steps. 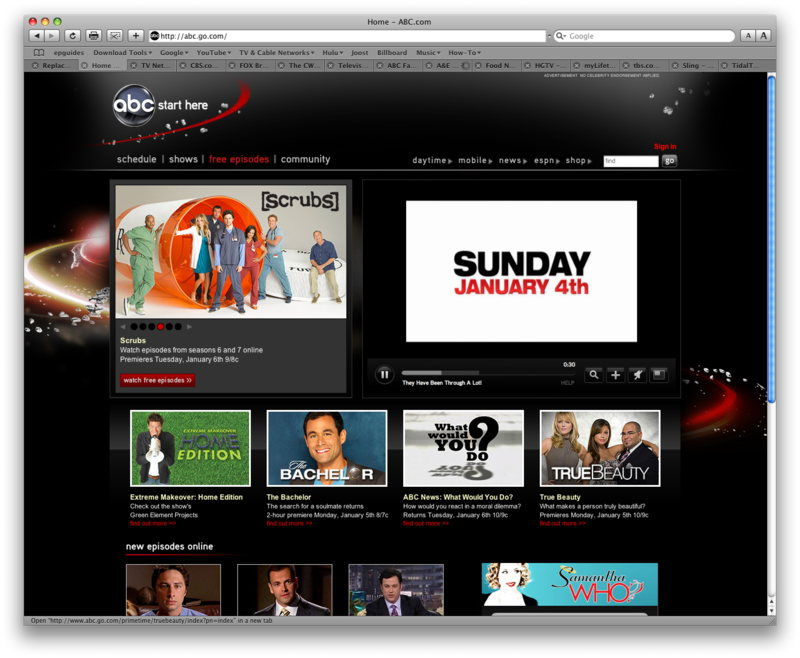 The American Broadcasting Company’s page is filled with clicky goodness, and free episodes is in large red lettering. OK, it’s a giant advertisement for their linear-delivery network – but it seems internet-delivery friendly enough. A loop of 8 short videos plays in a flash player and they do a pretty good job of explaining the ins and outs of watching TV on the web between the commercials for Scrubs and Desperate Housewives. If only watching the episodes themselves was as simple. 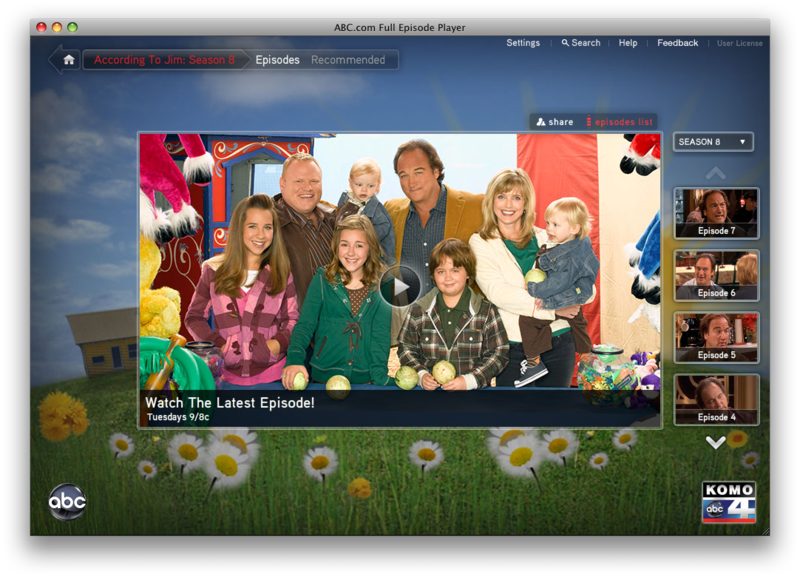 ABC still insists on using their Full Episode Player, which is a separate browser plug-in. 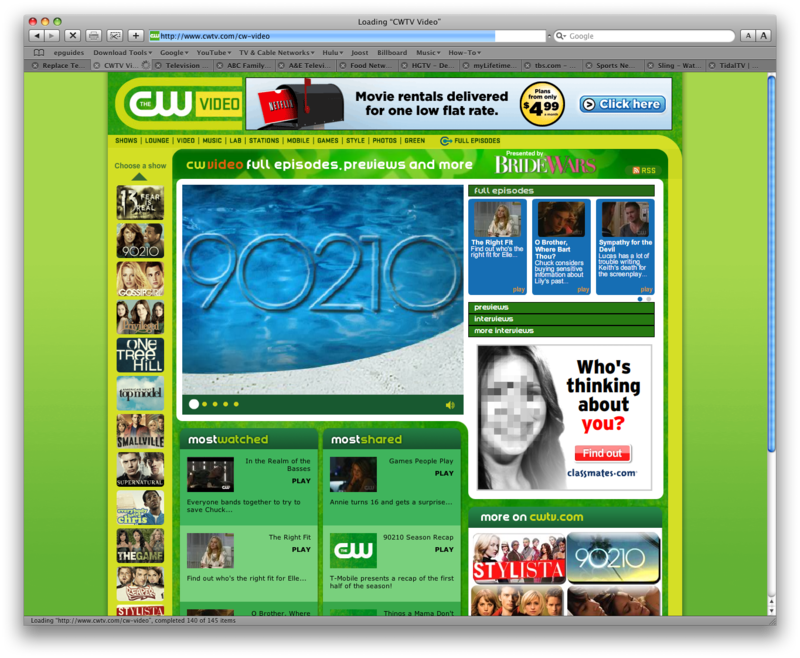 The last time I used it it was slow to load, choppy to navigate, and had only one episode of each show online at a time. Yikes. I was reluctant to click it. I shouln’t have been. What a great improvement! Not only in stability and speed, but in usability. There isn’t a very big archive, but if you want to watch new episodes, ABC.com has you covered. 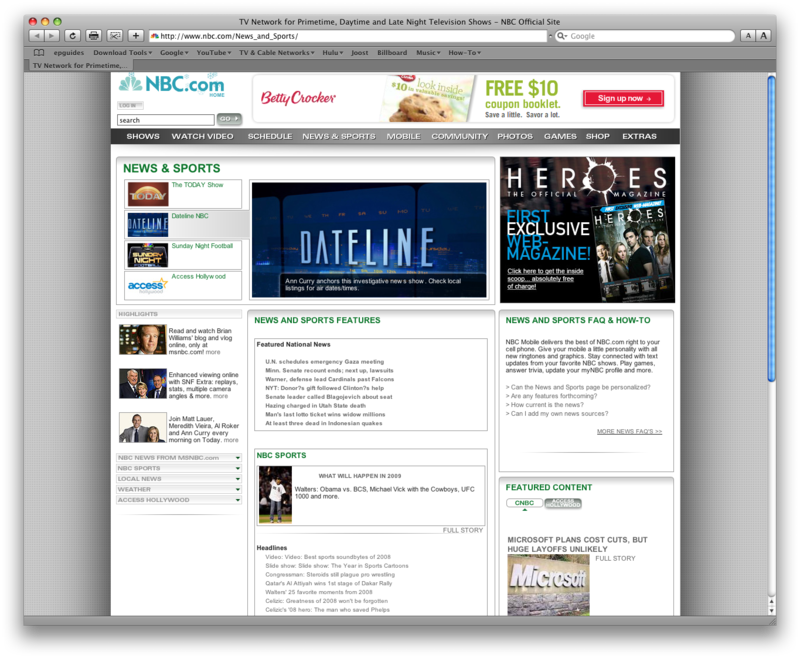 After ABC’s clean site the National Broadcasting Company’s site looks like a barrage of text, a newspaper. I scanned the page several times before I saw Watch Video or Watch Full Episodes. Their navigation system is confusing, and what shows up on the page depends on how you navigate to it. If you first click Watch Video in the toolbar then choose a show, you can never get to the same info as you would have found had you clicked “Watch Full Episodes”. 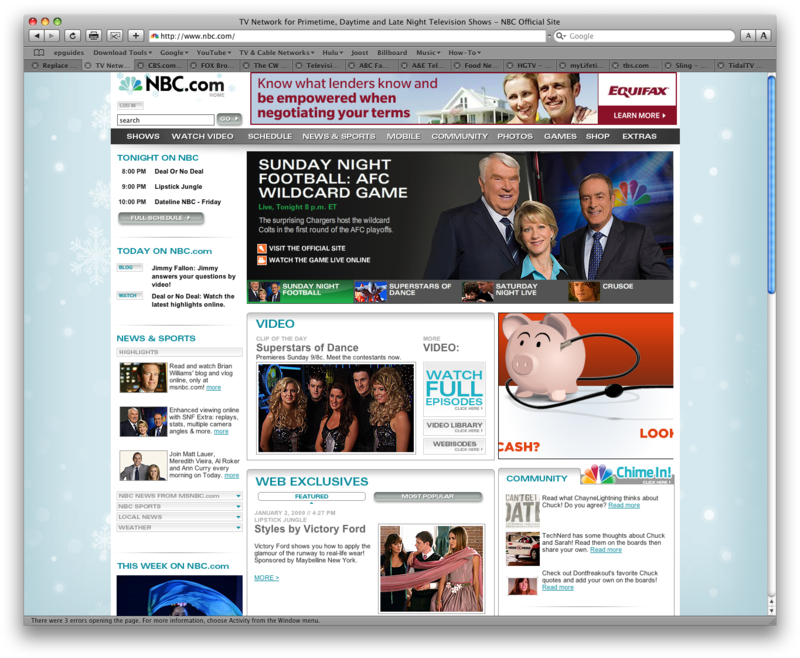 NBC’s site has a lot of content, but considering it’s all mirrored at Hulu, It’s hard to find a reason to go to NBC.com. The Columbia Broadcasting System is the farthest behind. The page is one giant advertisement for their liner-delivery method. 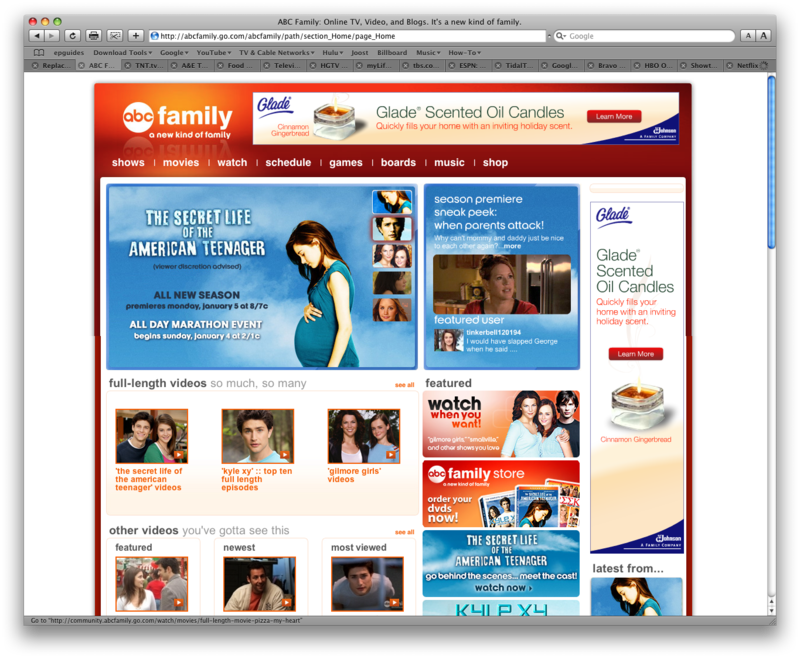 It’s filled with clips, re-caps, behind-the-scenes fluff pieces, and teaser-trailers for upcoming episodes. The kind of shovel-ware content that DVD producers have been calling “Special Features” so every release can be called a Special Edition. 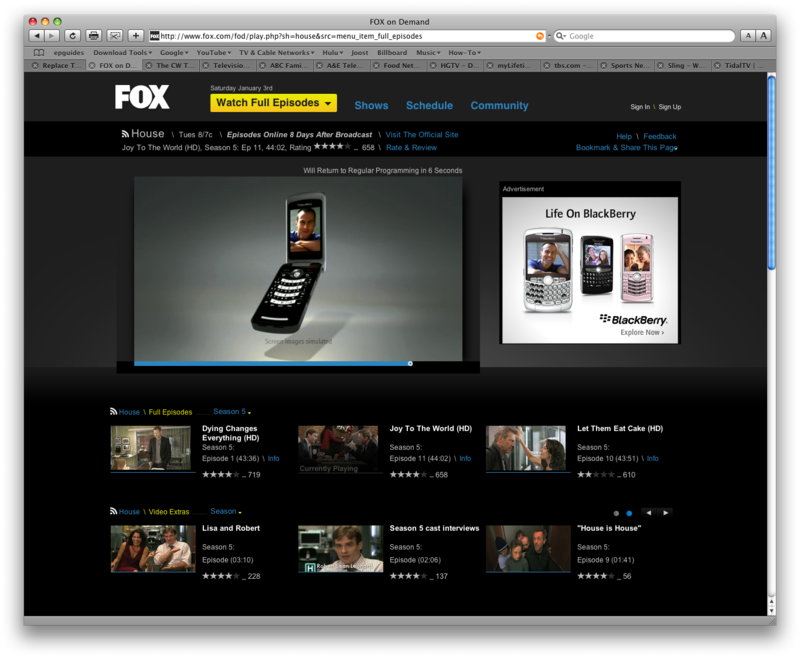 Every click on their site brings another auto-playing video Blackberry ad. 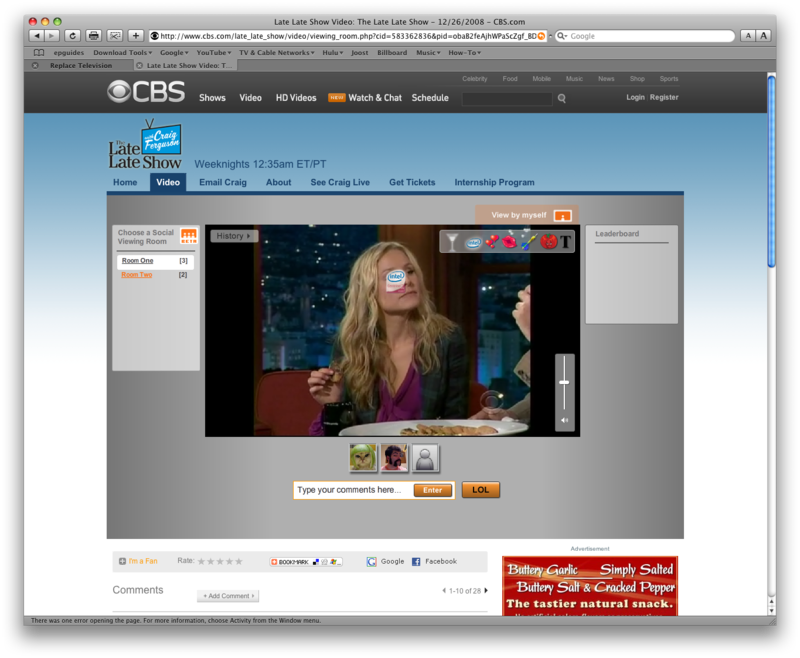 CBS makes the availability of full episodes less-than-obvious, and when you DO find them CBS makes you join a chat room in order to watch it. Yes, you can opt out but you have to log in first. 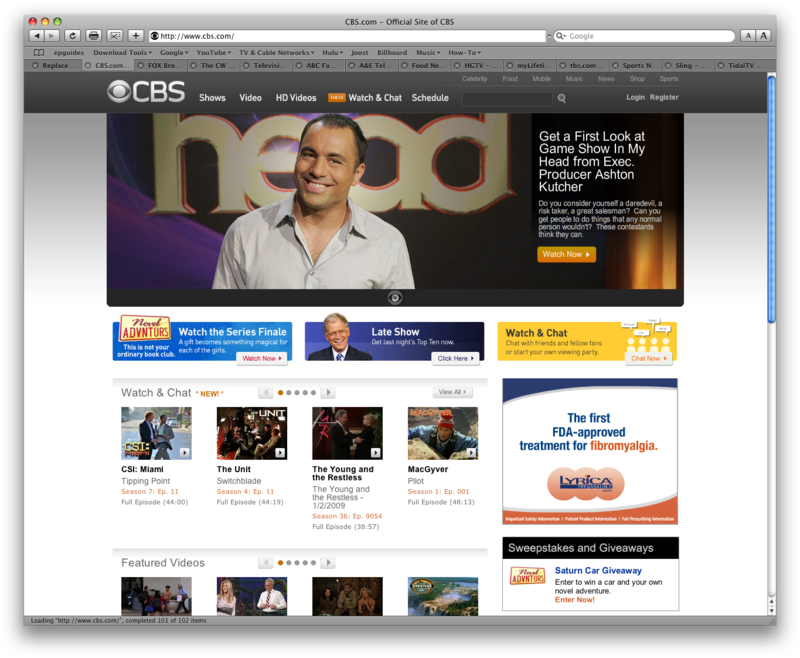 I chose Late Late Show with Craig Fergeson… which, after a looong load time, I joined in progress. It didn’t start at the beginning! Clicking “Watch By Myself” starts it from the beginning. I guess you can’t be social AND watch from the beginning unless you have impeccable timing or a lot of patience. 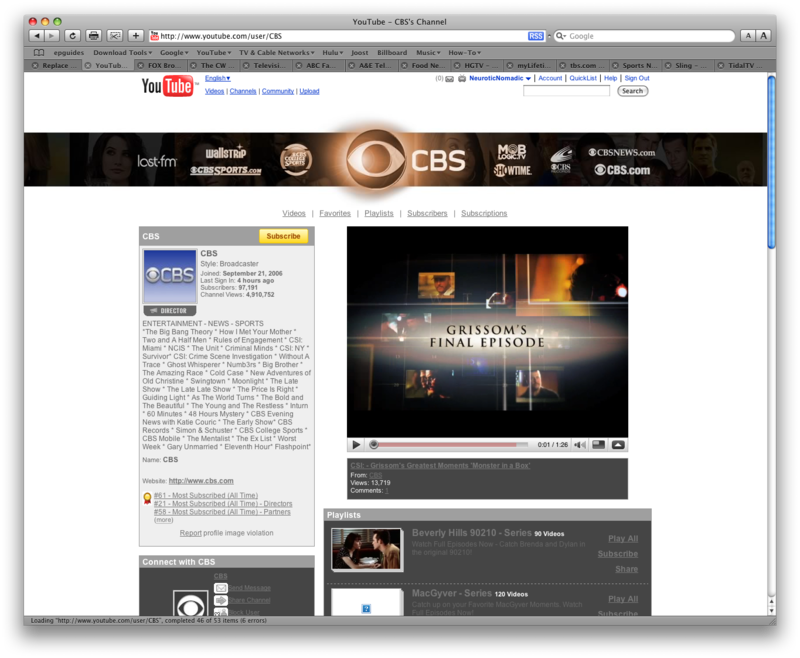 Also, CBS viewer is the only Flash Player I’ve ever seen with advertising logos. The social interaction allows you to put the Intel Inside logo and chime on the video, for everyone else watching to see. I don’t know what to say. 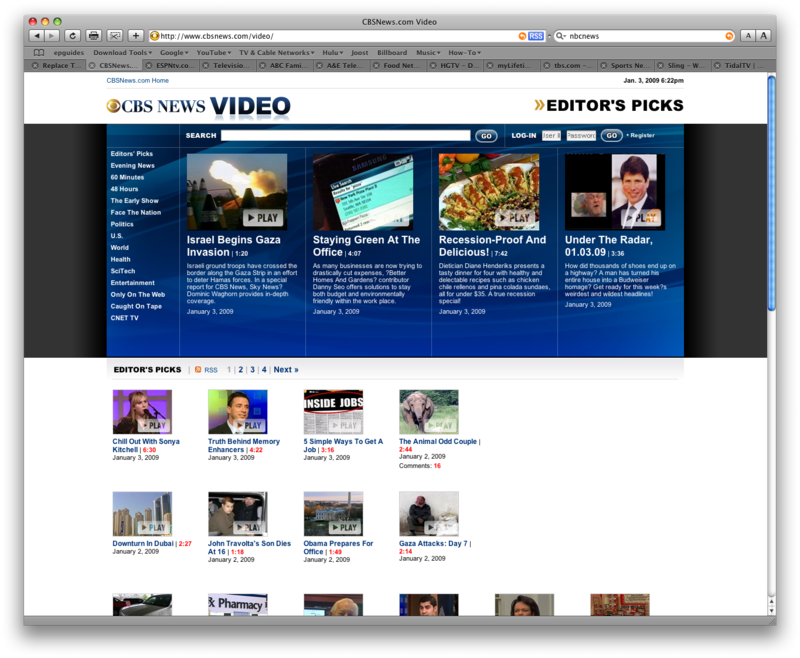 CBS has a YouTube Channel, but the content is just as lame. News Corp. owns 20th Century Fox which owns FOX Television which owns FOX on Demand. F.O.D. is easy to navigate and content is plentiful. 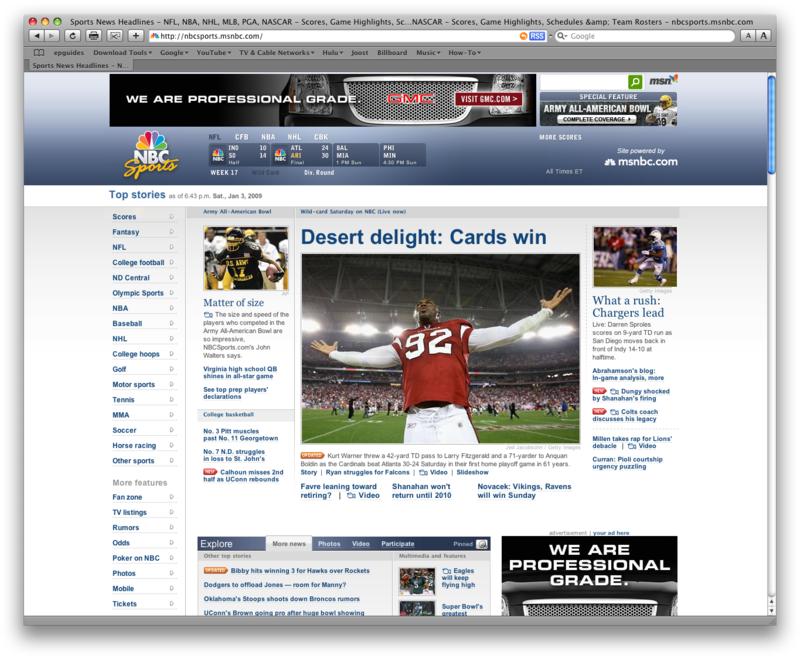 The site even seems to put a priority on streaming over broadcast. Didn’t see it when it was on the air? Watch it here! Watch it now! it invites. 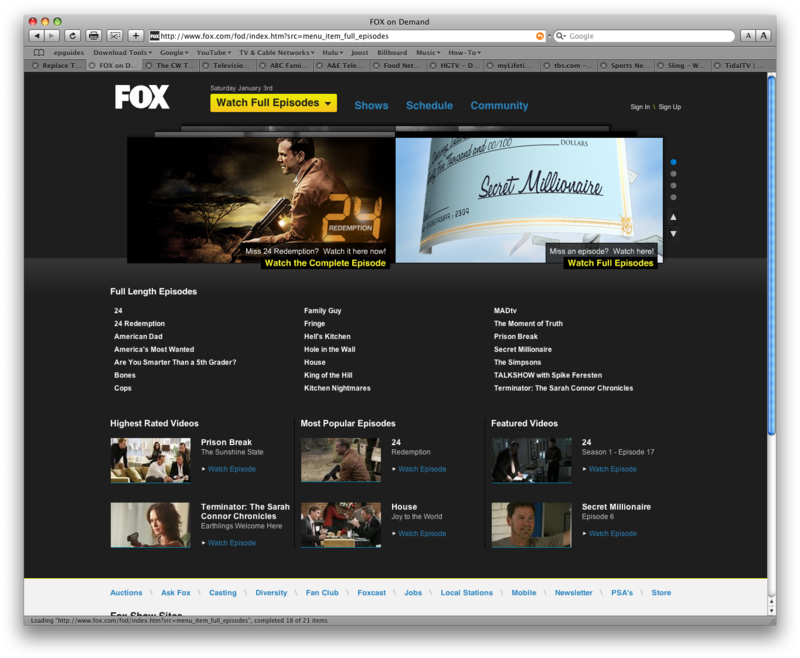 It even has little niceties like when an episode will show up online and what episode in the list is currently playing. 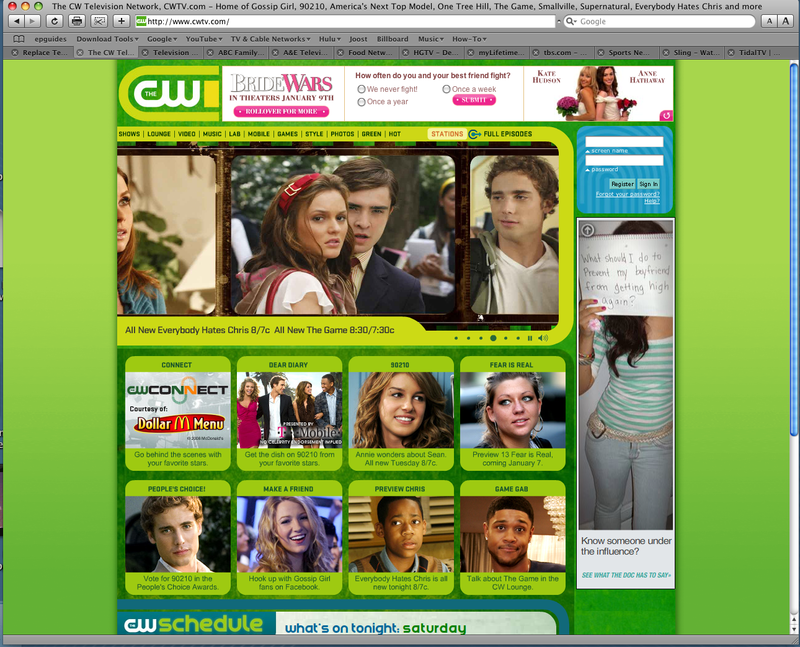 Born from a union of Warner Brother’s The WB and Paramonunt’s UPN, The CW is the hot network for young adults. 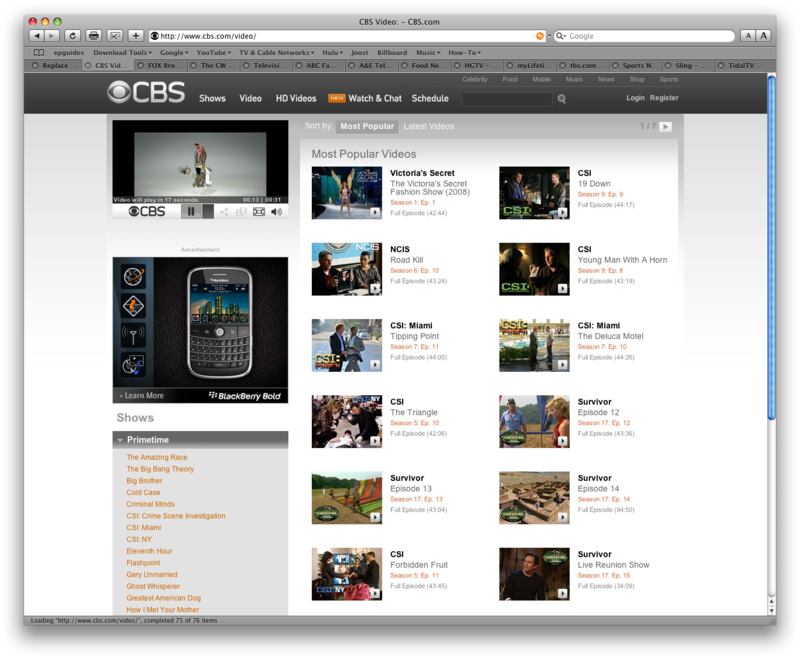 The Full Episodes link on the main page is small, but the content makes up for it. 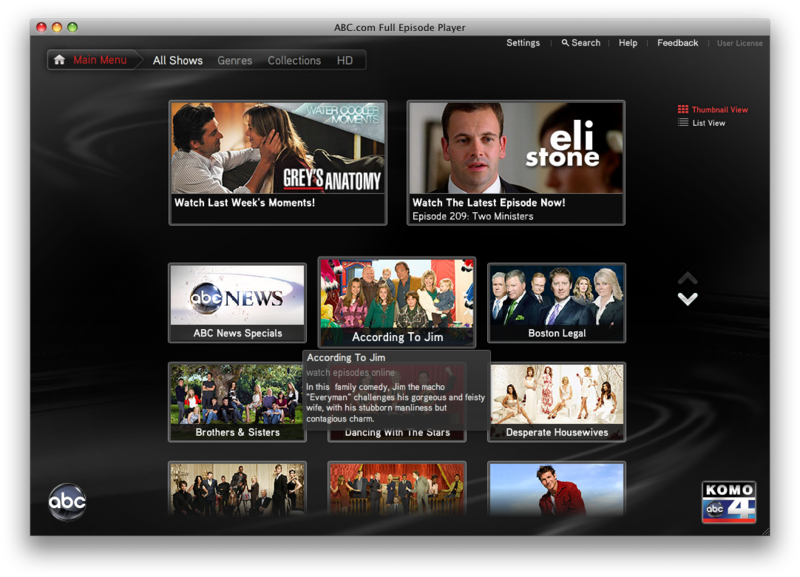 During the regualr season, all the latest episodes are available for instant viewing. However, today, there are only a handful available for viewing. 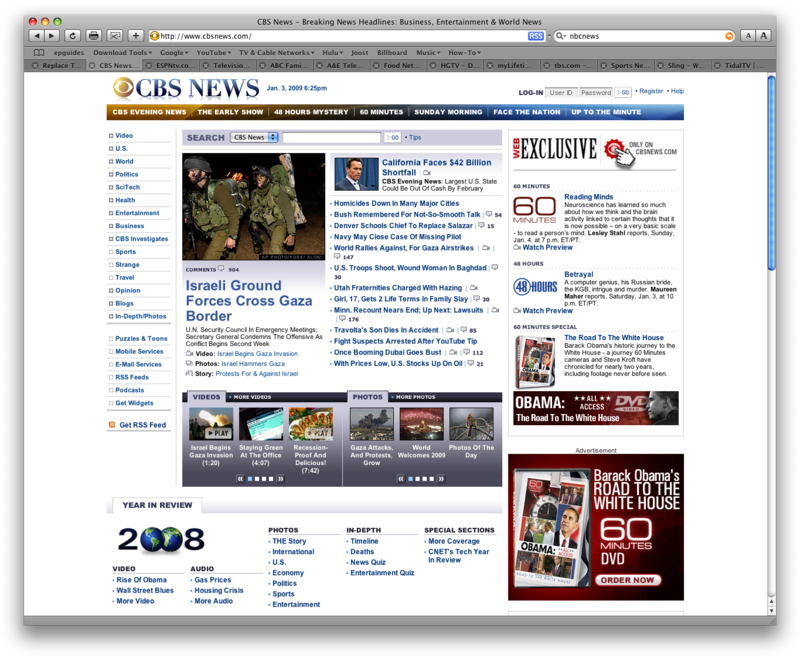 Like CBS, the Public Broadcast System’s home page is a barrage of text. 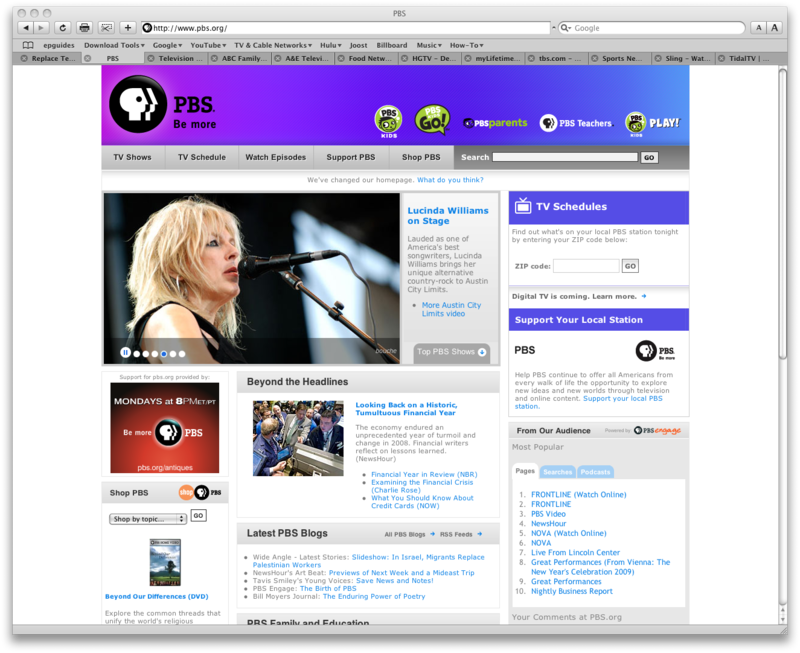 Watch Episodes is easy enough to spot, but the collection of videos is a just a fraction of PBS’ archive and it doesn’t seem to be updated with any regularity. Perhaps we should get the new President to put more than just his weekly address on YouTube. 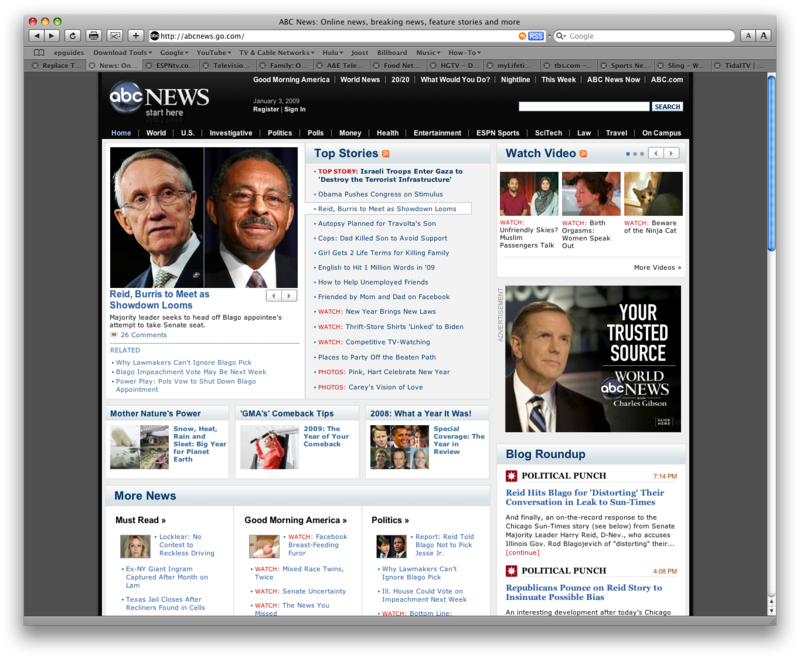 ABC News pulls up like any other news site. 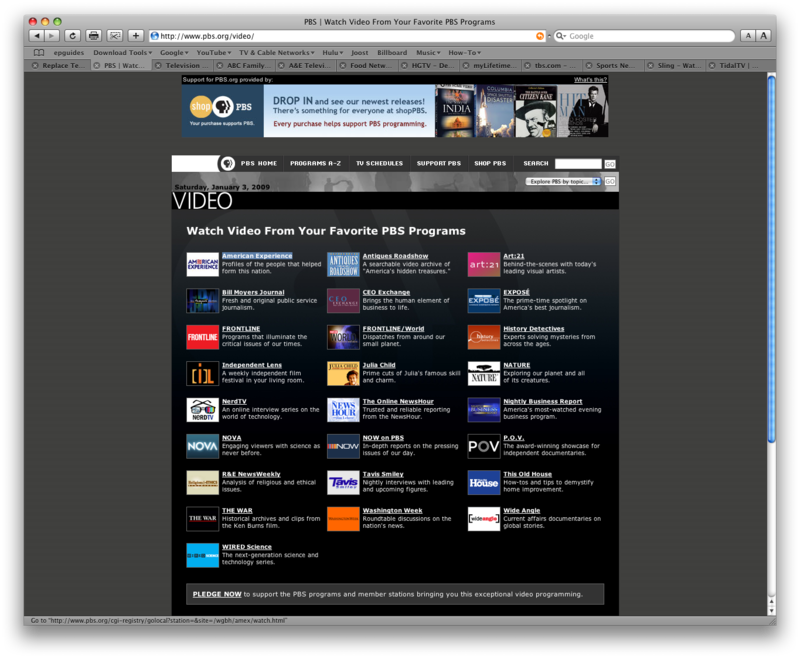 In fact, the Watch Video link is so subtle, you might underestimate how Streaming Friendly this site really is. 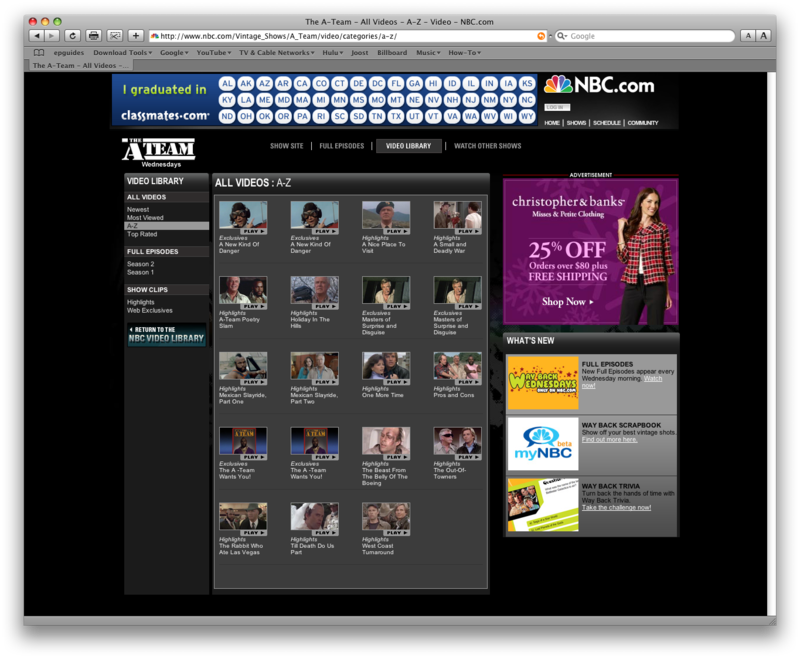 Like it’s parent channel’s site, ABCNews.com use the Full Episode Player, but instead of being designed around Prime Time Programming, it centers on ABC’s News division. 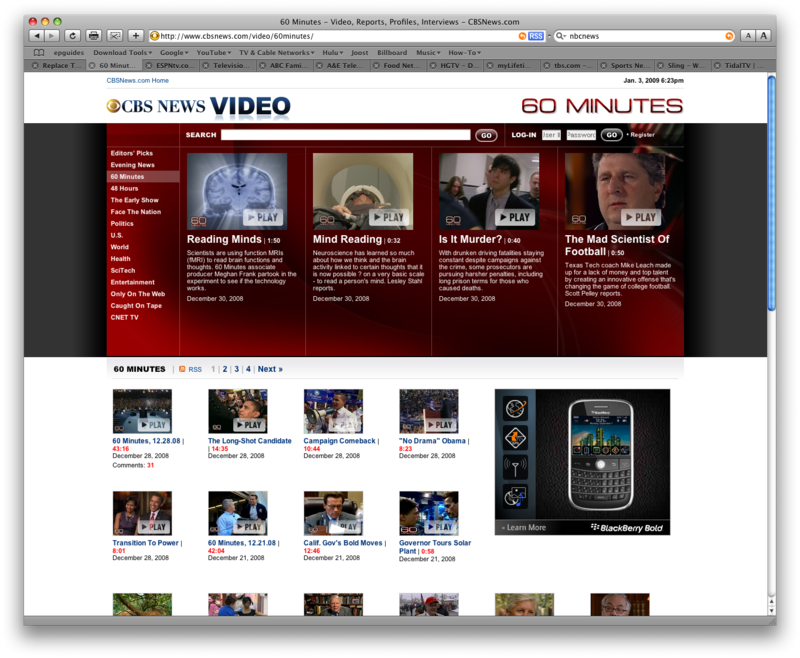 Good Morning America, Nightline, World News Now, 20/20… they’re all there in their entirety. Not very video friendly at all. 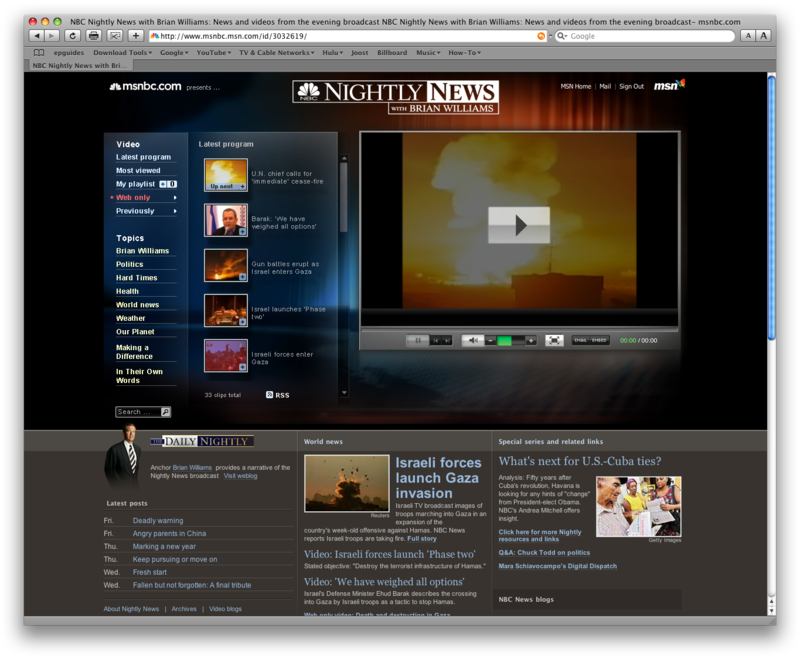 With some clicking around I found some clips of the NBC Nightly News with Brian Williams hosted on an msnbc server. Not very video friendly at all. The word Video is in TINY print, then it’s mostly just clips. Full Episodes are rare and hard to find. I’d give it a C+. 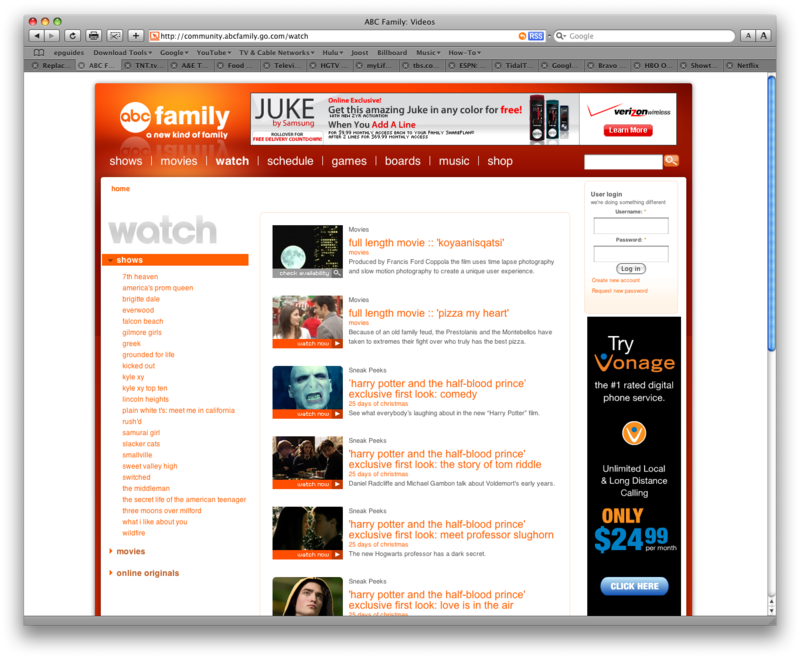 I used to think of this as the easy to use ABC Network site but with the radical improvement to the Full Episode Player @ ABC.com and ABCNews.com, ABC Family now seems clunky. There’s lots of content, both new and vintage, including some Made-for-TV movies. Full Episodes, Clips and Previews are well balanced.